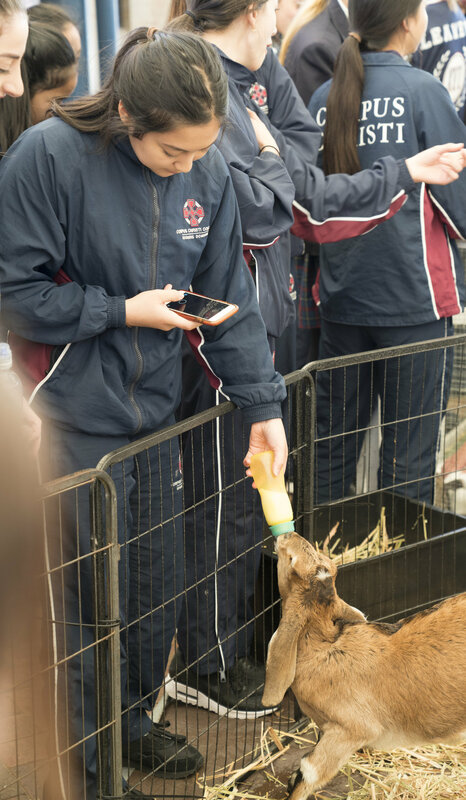 Education at Corpus Christi College is a multi-faceted experience for our students. Never has this been more evident than in the past few weeks. Many of our Year 12 students will be exercising their democratic right as voting citizens for the very first time. As Catholics, we are challenged to inform our conscience, to pray and discern prior to making decisions such as this one. Discussions which occur in classrooms will promote knowledge and understanding of all sides of arguments, whilst informing students of the Church’s view and the reasoning behind the teaching. Extremist views which deride one view or another, whether vilifying a person or using vulgar terminology is certainly not acting in a Christ-like way. To know and love Jesus, to show this in how we treat our neighbour regardless of their circumstances or way of life, to try to be more like Him on our journey through life. This is the essence of a Catholic education. · Paul Dillon spoke on Alcohol, Drugs, Parties, and Risk-taking Behaviour – on different age appropriate themes to Years 10, 11 and 12 students. The students tell me they look forward to these talks each year, and learn a great deal from Paul and the expertise he brings to his presentation. 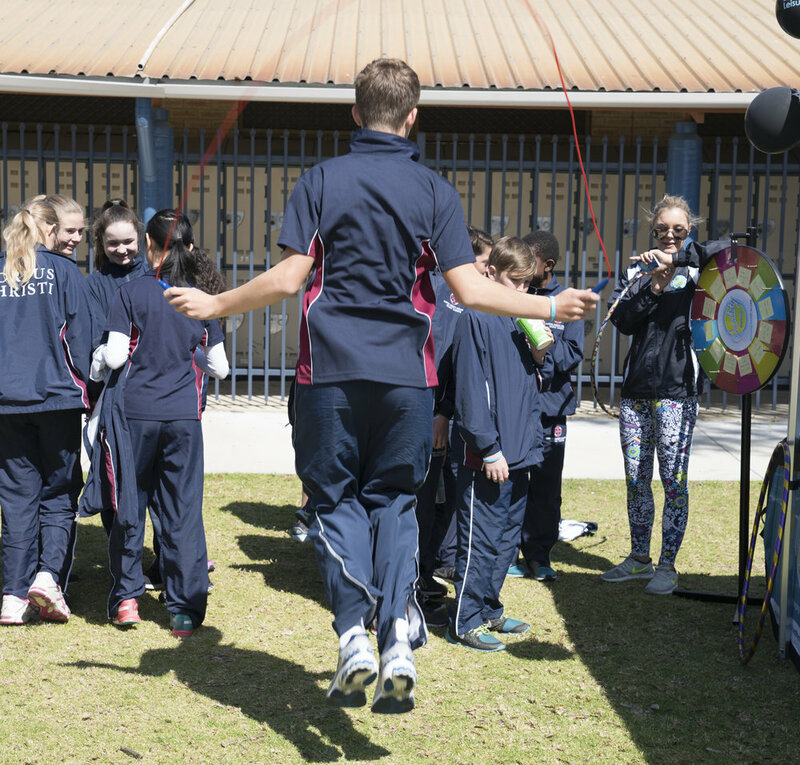 As part of the Act-Belong-Commit Healthy School Program and celebrating R U OK? day, College Counsellors Mrs Rachel Goodchild and Mrs Luisa Rossi coordinated the Mentally Healthy Lunch hour in Week Nine. 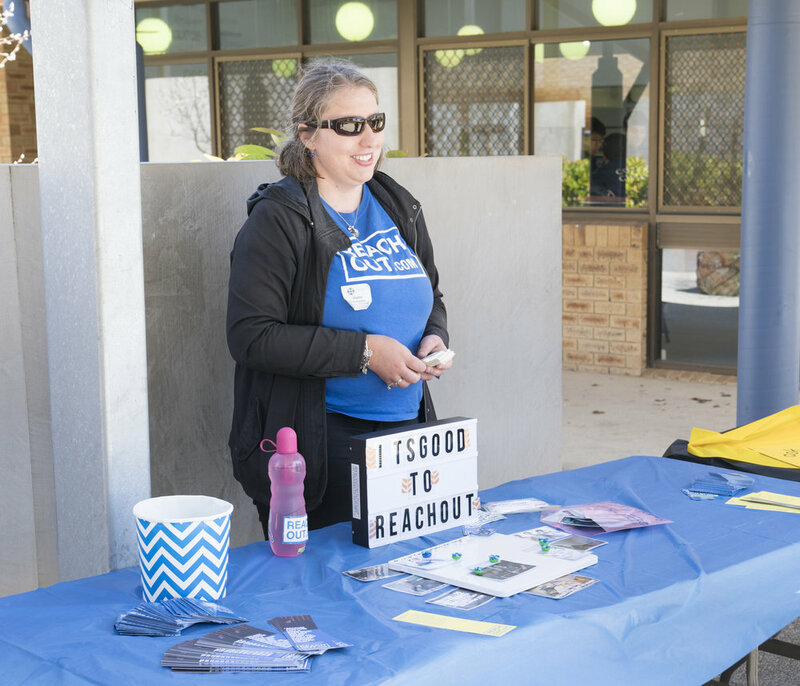 It was wonderful to see staff and students commit to participate in a range of activities and access information about a range of local support agencies, with staff and students mingling in the Mater Christi Avenue on a brilliant, sunny day. Stalls included Melville City Council youth officers, Jets Fitness Club, the Barnyard Buddies held all sorts of animals for our students to cuddle, Young Vinnies, Art Therapy, martial arts, a very popular silent disco, Boys Circuit and Group Fitness classes, a Dairy Free Ice-cream van, the ever-popular Boost Juice caravan, and many more activities and stalls. · Associated and Catholic Colleges of WA (ACC) Athletics A Grade Carnival held at Challenger Stadium, with the Corpus team achieving a commendable equal second with Peter Moyes Anglican Community School, first place achieved by Sacred Heart College. Ours is a fine achievement when you consider the number of schools in the entire competition, and our second year of gaining second place. With outstanding individual performances and records broken, please check the details Sports Coordinator Mr James Howard has recorded. · Shield winners The CELTIC Band received rapturous applause after performing at the Catholic Performing Arts Festival Final Concert at the Perth Concert Hall. o The annual Arts/Technology and Enterprise ‘Kaleidoscope’ exhibition was an outstanding success. Given three students received major honours at the Catholic system’s Fra Angelico Awards night recently, it is no surprise that the talent exhibited was of a very high standard. 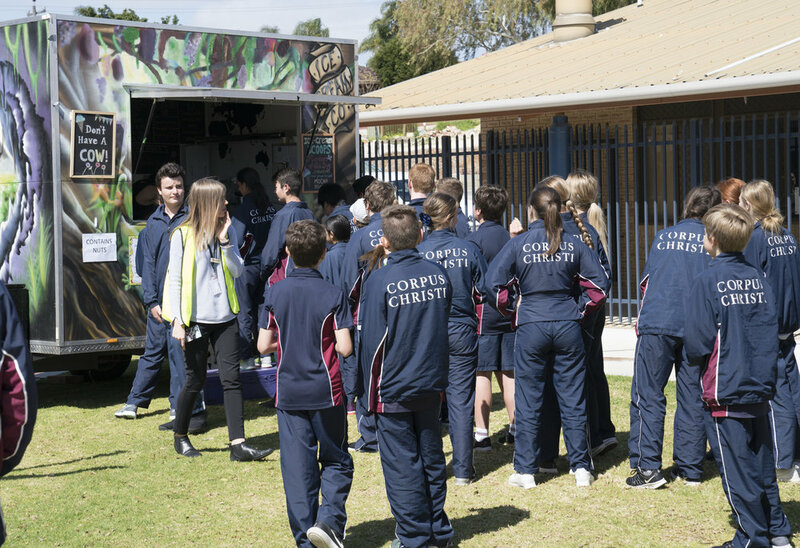 Included in the exhibition week was the Year 12 Drama and Dance performances, and for our Year 7s, grandparents were honoured at the Grandparents Mass, with refreshments provided in front of the Mater Christi Centre, as well as tours of ‘Kaleidoscope’. o With a Year 7/8 Drama Production ‘New Lights’ on Tuesday, and two Year 9 Productions ‘The Weather Girl’ and ‘Year 9 Are Animals’ on Wednesday and Thursday nights this week, I take this opportunity to thank Directors Messrs James Dove and Adrian Richmond on the preparation of students who were involved. o Year 9 Personal Project Exhibition was made up of more than 200 booths. Congratulations to Head of Year 9 Mrs Yvette Pearce. o Celebrating Excellence Evening showcasing our individual talented and gifted program projects, this event was coordinated by Mrs Filipa Carvalho. Many students were presented with badges and certificates after showcasing their work. · The selection of the 2018 Prefect Committee from our Year 11 cohort has now been finalised. A rigorous process including Head Boy and Head Girl nominees delivering speeches in front of their peers, Year 11 and Year 10 students, followed by voting by staff and students and an interview with the Principal. I congratulate Liam Rego and Jessica De Freitas Basilio on their appointment as Head Boy and Girl respectively, a role which will commence in Term Four after our Year 12 students graduate. 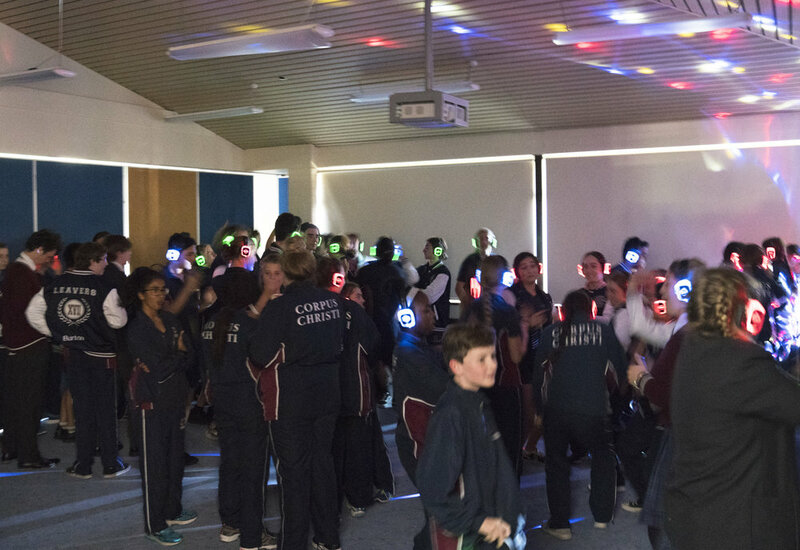 · Year 8 STEM (Science, Technology, Engineering and Mathematics) project: Year 8 Science, Technology and Mathematics teachers worked on a collaborative project which students learned a great deal and enjoyed immensely. ‘Project Centre’ was the Tony Curtis Centre! 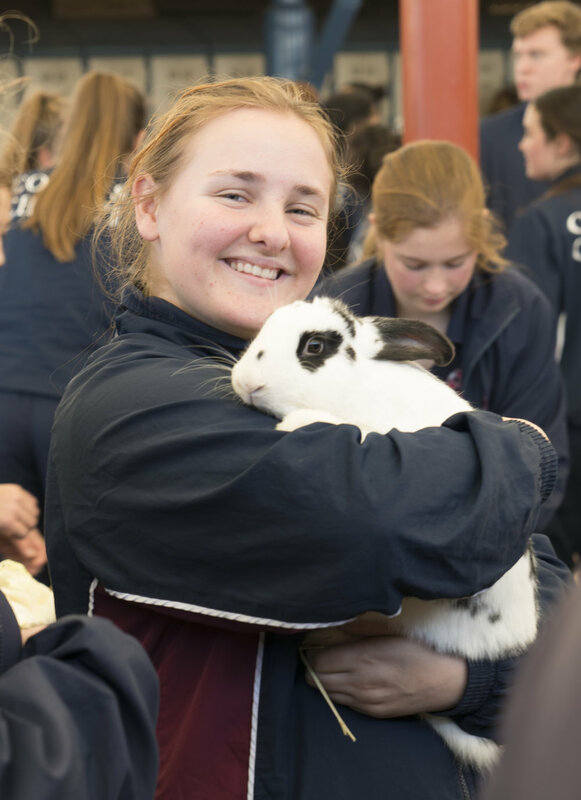 · Parent Night: Year 9 to Year 10 2018: The major theme of the night focused on Year 9 students selecting either an ATAR pathway for Religious Education, English, Mathematics, Science and Humanities, or selecting a Vocational Pathway in these subjects which also opens the door to some workplace learning opportunities during the year. Several students have also opted to commence Year 11 WACE courses in Year 10, so are studying such courses in Mathematics, English Literature, or Economics. On behalf of the Corpus community, I take this opportunity to thank all the staff who have been involved in the preparation of students for these events. Corpus Christi Certificate of Endeavour Awards will be presented at Assemblies this week. As I signed these certificates, I was delighted to see a broad range of students who work very hard but often do not receive the highest marks in subjects, achieve these special awards which are presented twice per year. · thorough completion of homework and assignment tasks. I congratulate all students who have worked above and beyond! With Ms Jennifer Overend having commenced parental leave, we welcomed the return of Mrs Chanel Fenwick who will be acting as Head of Year 8 until the end of the year. I take this opportunity to also farewell those who covered staff on leave, including Italian teacher Mrs Monica Smokrovic, and Health and Physical Education teacher Miss Kristen Nairn. We are delighted Kristen will be returning next year to cover another contracted position. I also take this opportunity to thank those who had acting roles this term: Mrs Sue Cooper who covered the Head of Languages, and Ms Wendy Quint, who covered two roles, the Head of Vocation and Transition, as well as Workplace Learning Coordinator. I am delighted Wendy will continue as the Workplace Learning Coordinator from next term. Next term, Science teacher Miss Joanne Stevens, ESC teacher Mrs Brooke Bleakley, Library Assistant Mrs Joan Fodor, and Humanities teacher Mrs Lidia Di Giuseppe (from Week Four), will be on leave. We wish them all a well-earned rest. Please keep in mind many of our Year 12 students who will be focussed on their studies and will sit for their trial WACE Examinations in the second week of the holidays. Several students have already commenced their WACE Practical Examinations, which will continue into the first week of the holidays. Year 11 students will also be studying for their examinations that commence on the first week in Term Four as they complete their Year 11 courses. These students will be in our thoughts and prayers in the coming weeks. Irrespective, please have a safe and restful holiday with your families, returning on Monday 9 October, all energised and ready to welcome the final term in our academic year.